Technology, the extent of government intervention and society's relationship with energy are some of the critical potential sector uncertainties out to 2060, energy leaders say. Those issues were among a wide range of uncertainties raised by about 60 people who attended a BusinessNZ Energy Council 2060 workshop held in Wellington yesterday. Attendees included major energy users, those from the hydrocarbon sector, power generators and retailers, government officials and academics. They were asked to consider the BEC 2050 scenarios and a Whiteboard Energy case study on the changing role of Government involvement in the New Zealand power sector over the past century. 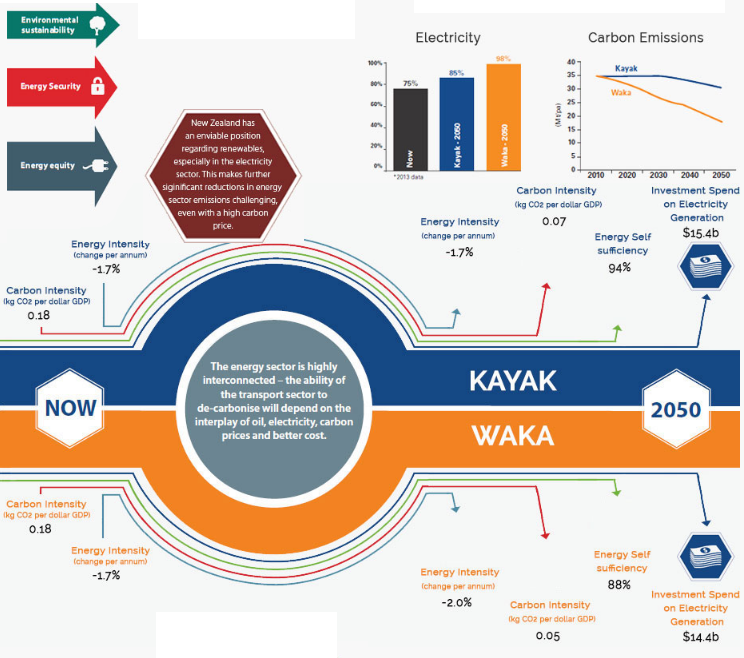 The 2050 scenarios – published in 2015 - contrasted a market-driven “kayak” future with a “waka” future with a more centralised economic input. BEC executive director John Carnegie says the exercise is not about predictions or expectations. It is about exploring possible changes to the sector over the next 42 years to inform the 2060 scenarios, and update BEC's earlier scenarios. He notes that discussion on technology within the sector is evolving. He says "stock and trade" issues such as resource availability and energy affordability were also raised by those in attendance. Sapere Research Group director Toby Stevenson opened the discussion about the uncertainties out to 2060 before smaller groups scoped possible issues. He noted the election of the Labour-led Government last year and its environmental focus. Prime Minister Jacinda Ardern has said climate change is her generation’s “nuclear-free moment”. The Government wants the economy to be net zero-carbon by 2050 and all power generation to come from renewable sources - in a normal hydrological year - by 2035. It is also conducting a review of household prices focused on fairness and equity for consumers and whether existing industry structures can accommodate the rise of emerging technologies. Stevenson contrasted the situation today with the 1970s which saw the rise of New Zealand’s modern environmental movement through the Save Manapouri campaign. Hydro represented 80 per cent of the country’s generation mix in 1976 and Stevenson says the campaign signalled the end of “big hydro”. Nuclear generation was also actively considered back then. Stevenson notes that Robert Muldoon’s option of a public inquiry into nuclear in the run-up to the 1975 election, rather than the Labour Party’s option of an independent fact-finding group investigating the issue was preferred. “This was the community wanting to take some say in how things were done,” he says. Stephen Batstone, also a director at Sapere, outlined the findings from BEC's 2050 scenarios during yesterday’s session. He says the 2060 edition aims to be more New Zealand-specific given the unique nature of the local energy sector. That includes the role of hydro within the power generation mix. The 19 uncertainties for 2050 were broken into two possible scenarios. Stevenson likened the process of converting uncertainties into two plausible and consistent narratives to a game of twister. World Energy Council secretary general Christoph Frei highlighted the falling prices of renewable technologies, green molecules and geopolitical changes in a short introduction video played to the audience. Carnegie says leaders need to think about global and societal changes and government decisions because “all of those sorts of things will shape whatever our energy future will be”. The broad ideas discussed in yesterday’s workshop would now be refined and re-scoped over time. A second workshop will be held in either August or September. Insights from workshop attendees will be combined with assumptions from the BEC’s end-to-end energy model. That model is being developed by the Swiss Paul Scherrer Institute and will be hosted at the University of Auckland. Finalising the 2060 scenarios will likely take the next six-to-eight months. Carnegie says that timeframe is necessary because the scenarios will help shape how the organisation and its members think about the future of the energy sector in New Zealand.